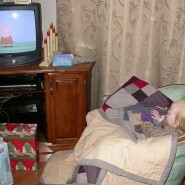 American babies and toddlers watch an average of 1 to 2 hours of TV a day. ONE TO TWO HOURS OF TV A DAY! And that time spent in front of the TV is harming American children, the American Academy of Pediatrics says. When I read this scary statistic I thought about how we frum moms might have our own issues and meltdowns and parenting flops, but on the other hand many of us JewishMOMs are managing to doing what is considered an impossible feat by Western society: we are raising our kids TV-free. And that is a tremendous gift we give our children every single day. Instead of watching TV, our kids are reading or studying or playing or helping or talking or thinking… In other words, instead of watching TV, our kids are living! Cute Jewish Child + Corn Chips = ? I actually thought the numbers would be far, far worse. How many of us let our kids watch some kind of educational or Jewish content video, every day? That’s almost an hour. I’m not going to get my feathers ruffled over that. It’s what keeps me sane! Kudos to all you mothers who manage without any “electronic babysitting” (a term I loathe) at all !!! !